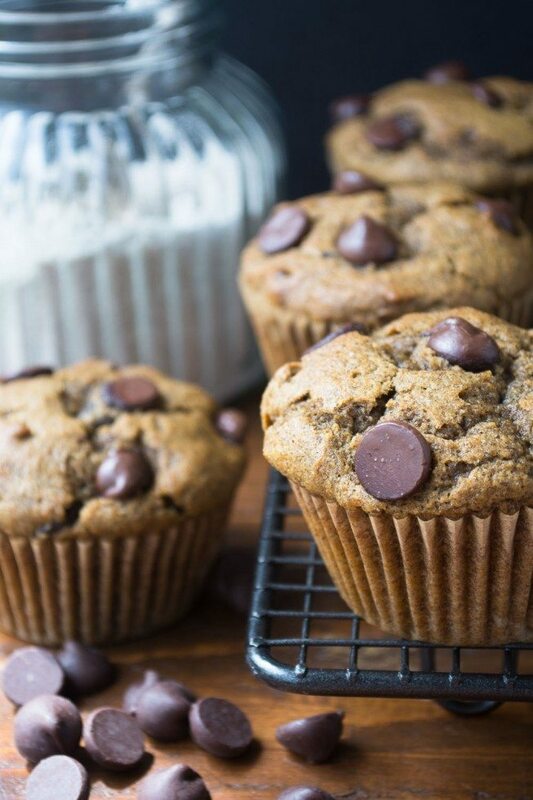 7 Grain Pumpkin Chocolate Chip Muffins ~ these healthy whole grain muffins are light and fluffy with seven different types of whole grains! In a large mixing bowl, whisk together the first 11 ingredients. Make sure to work out any lumps in the brown sugar. Fold in the flours, and then the chocolate chips, being careful not to over mix the batter. Spoon or scoop the batter into the muffin tin. This recipe makes 11-12 muffins, so you can mound the batter a bit. I like to pop a few extra chocolate chips onto the tops of the muffins before baking for an extra tempting look. Push them into the batter slightly with your finger. Bake for 25-30 minutes, depending on the size of your muffins, or until they have fully risen and are not jiggly or wet in the center. You can use a toothpick to check. If you are baking these the next day from the fridge, I recommend letting the batter come to room temperature before baking. These muffins are magical when eaten warm. You can also reheat them for 15 seconds in the microwave.